Where do you plan to watch Super Bowl 52? If this isn’t your year to host and a house party hasn’t popped up yet, take a look at some of the North County sports bars below for Super Bowl game viewing. There’s nothing like someone bringing you burgers and beers while you’re surrounded by dozens of TVs broadcasting all the game action (and ads). Save yourself the clean-up and join Westroot’s backyard BBQ scheduled for Super Bowl Sunday. The newish Carmel Valley neighborhood spot will serve hot dogs, brats, tri-tip and ribs with coleslaw, fries and potato salad, along with chili and beer cheese starting at 3:30. Eat all you can for $25. Plus, you’ll get a raffle ticket for halftime prizes like gift cards, apparel, and more. The 40,000-square-foot space features a state-of-the-art sports bar and a massive wall of HDTVs, perfect for the ultimate big game viewing party. Take in the action in between sucking down Buffalo Wing Burgers, Crispy Nashville-Style Hot Chicken, beer, craft cocktails and more. Here’s a win-win: you watch the game while the disinterested among your group go bowling (or shopping in the mall)! Whichever camp you fall in, you’ll enjoy Tavern + Bowl’s game day specials and prizes. This locally owned neighborhood restaurant features 30 draft beers and more than 150 types of liquor with which to toast your team. And did we mention the 52 TVs? Chow on burgers, seafood, wings and pizza, and if you’re a family person, bring the kids too. Rookies welcomes all ages. 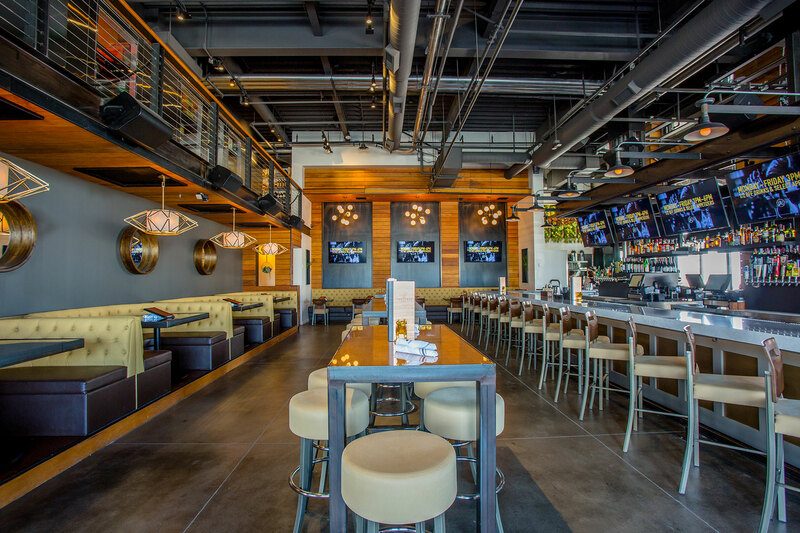 This award-winning sports bar and craft beer hub boasts locations throughout San Diego and every one features huge flat screen TVs and craft brews on tap, ensuring Super Bowl viewing success. Enjoy an all-day happy hour at Green Dragon Tavern on Super Bowl Sunday. Set yourself up in front of one of the tavern’s seven large screens, order your beer or wine, and choose from burgers, fries, nachos or 75 cent wings happy hour specials. P.S. Wondering about the “museum” part of the tavern’s name? The Green Dragon Museum is part of the property and houses documents from the colonial and Revolutionary War eras. Sit outside or in at this beer, burger, bar food joint. Doesn’t matter – there’s 28 50-inch HDTVs for sports viewing from every angle. Can’t go wrong with 55 Yard Line located on Old California Restaurant Row in San Marcos. You have your 24 flat screen TVs, local craft beer, and even breakfast if you want to stake out your seat early. D Street packs ’em in for sports viewing thanks to its vast bar menu and ample TVs. The cozy but open dining areas ensure you’ll be able to comingle with other sports fans if you’re feeling friendly. What are your Super Bowl watching plans?